Dear Noonan Artists, As many of us joined forces recently in support of Forest City's Prop F, I thought you might enjoy my take on today's event at Building 12. A neighborhood BBQ to kick off the campaign was so much more than dry speeches and politicians kissing babies. It was an informal gathering that drew people from all points of the city. People from different backgrounds and perspectives. A diverse group of people who were positive, supportive, and very enthusiastic. What is happening in our Pier 70 has become an inspiration for other neighborhoods who face development. All of the San Francisco supervisors praise the outreach and progressive agendas that are the cornerstone of FC's redevelopment plan. Supervisor Scott Wiener said he is so impressed with this project that he plans to implement it as a model for his own district. Mark Leno applauded the beyond generous allotments for affordable housing and said a new bar has been set for development in SF. The president of the Sierra Club praised the forward thinking in resolving rising water issues and protecting of our sensitive waterfront. Both former Mayor Art Agnos and current Mayor Ed Lee gave exuberant speeches on the many positive effects Proposition F and the Pier 70 project will have for our city. They spoke of low tech and blue collar jobs, affordable housing, affordable artist and small manufacturing space, improvements in transportation, preservation of our port piers and historic buildings, and the creation of public parks, open space, and access to the water. As a Potrero Hill resident of 21 years and a Noonan Building Artist for 16 years. I can honestly say I am very excited about the city wide support we have for the preservation and revitalization for our beloved Pier 70. It feels right, and I think it is a good time for the Noonan Building Artists to connect with our community. The public wants to know who we are, what we do, and what our future is. Open studio should be extra special this year. I am looking forward to it. If you have not had a chance to update yourself on the prop F details, do check out the Pier 70 website. The NBA web site has been dormant for a month while our volunteer webmaster has been on a long vacation and extended family reunion. For this reason the posting of a report on the meeting we had on April 30 with representatives of Forest City, the developer for the re-boot of the Pier 70 area, was delayed. The purpose of that meeting was for Forest City to give us a clear picture of their vision for the transition of the Pier 70 area and of our place in the mix. The meeting also gave us at the Noonan Building an opportunity to ask questions and air our views. So here, for the record, is Kim Austin’s report on that meeting. The photo was taken during the meeting by Adele Shaw. Thanks to everyone who came out last night for our meeting with Forest City. It was a positive and productive event. Forest City has offered many tours of the Pier 70 project over the past 2 years, but this was the first time they focused directly on the Noonan Building and its artists. They gave a concise and clear view of what they would like to see as a potential future Noonan community. They listened to our concerns and suggestions for an affordable, functional, and aesthetic artist space. For several years now a handful of Noonan Artists have been going to meetings with the SF Port, the SF Port Commission, and Forest City. Our goal from the beginning has been to save the Noonan Building, preserve the artist community it houses, and to ensure future affordable artist space in honor of the Noonan Building history. In the beginning there was no mention of the Noonan Building nor its artists in the Port's Master Plan. But over time each group has listened to our story and has worked to include us in the future development of Pier 70. Last summer we had a major success when Forest City included us in the term sheet and the Commission signed off on it. This gave the first green light for the Pier 70 project to go forward. Last night we had another great coming together as we filled in some of the important details that were not defined in the term sheet. First FC gave a side by side comparison of restoring and bringing to code the original Noonan Building, and constructing a new state-of-the-art building that would replace what we have. All agree it is a touchy and emotional discussion. There is much love for our building, but there is also a lot that can be embraced in a new building that flows with the full Pier 70 project. The artists would be involved in the design process and a new space would allow for more community interaction. The cost of updating the original Noonan would likely be twice as much as building a new structure. Secondly, FC assured us that no artist would be left with out a space if there is a gap between old building and new building. The artists would either move directly into the new space, or we would get temporary space in one of the Pier 70 historic buildings. Possibly building 12 or 2. Finally FC discussed the issue that is on everyone’s mind who cares about the waterfront in SF. Prop B, height limitation, and voter approval. In June Prop B will most likely pass and this will have a significant effect on all Port waterfront projects. FC plans to have a measure on the November ballot that will focus on the community based projects in Pier 70 that will be affected if height limitations are not flexible. The Noonan Building and its artists will likely be the poster child and we and FC will get much more attention on preserving affordable artist space than previously imagined. So this is it in a nutshell. We would like to encourage all Noonan Building Artists to get involved and be part of the process. This is a long project that will take many turns and revisions. 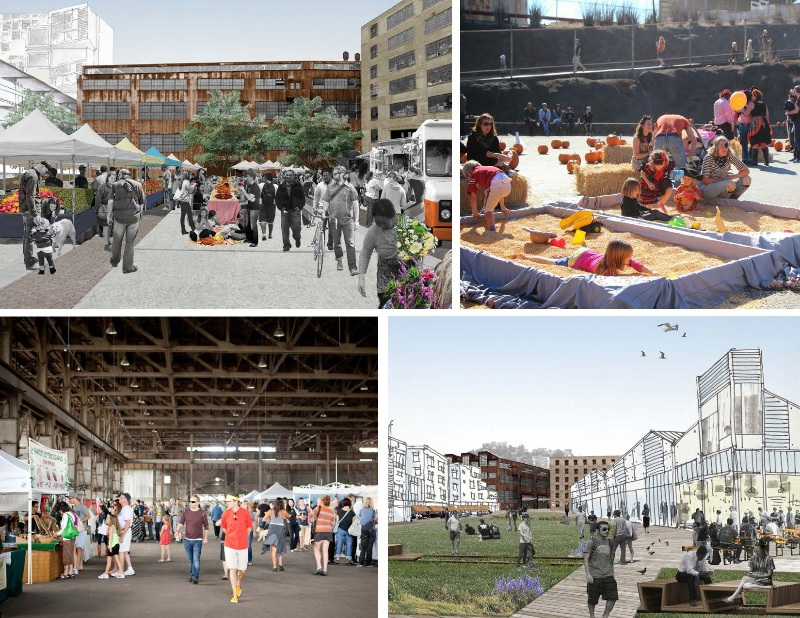 We plan to be there at each phase of evolution, and we look forward to preserving a unique and affordable artist community in Pier 70. Get involved or support special events in building 12. Currently the Bayview Pop-up Market every Thursday 5:30- 8 pm through the end of June. Forest City, developers of the Waterfront Site at Pier 70, are conducting an event on March 27, where they will be showing preliminary designs for the Pier 70 waterfront. The program will include a walking tour of the Pier 70 site,a brief presentation and Q&A, and an informal, open house-style discussion with the Forest City staff. All NBA members and friends are encouraged to attend, and if the open house events aren't enough of a draw, know that light snacks and beverages will be provided. To register for this event, follow this link to the Eventbrite website. Note that the event location has been changed to Building 12, at 420 22nd Street – the previous location was to be at the Orton office in the Noonan Building. Good afternoon Commissioners. My name is Suzy Barnard, speaking on behalf of the Noonan Building Artists at Pier 70. We would like to express thanks to Forest City and the Port for including us in the Term Sheet, which was submitted to the Port last week. We raised our concerns at the Port Commission hearing on May 14th about not being included in Pier 70's redevelopment plans, and it was very gratifying to be heard. We very much look forward to working together, in an atmosphere of trust and good faith. Firstly, since the wording on Forest City's Term Sheet regarding the Noonan Building Artists is brief and general, we wish to state clearly that affordable, comparable art studio space is required not only for all current existing tenants and sub-tenants, but also for the benefit of future artists, and request that a long-term commitment to affordable artists' workspace be made in order to perpetuate the long history of Pier 70 as one of San Francisco's few remaining vibrant creative centers. Secondly, the Noonan Building Artists remain committed to pursuing the option of preserving the Noonan Building itself, as a special building of historic significance that holds a living, breathing and current community within it. I think we all have to thank Suzy Barnard for speaking on our behalf yesterday at the Commissioners' meeting. She did a splendid job. She thanked the Commission for listening to our concerns, and thanked Forest City and the Port for including us in the term sheet. It was a very cozy, lovey meeting. Lots of supporters for Forest City and the SF Port spoke this time. The presentation to the Commission was brief and to the point, and it included mention of the Noonan Building Artists on several accounts. We were heard at the last meeting and are now inserted into the text. We have learned from these meetings about many dedicated people who have been working tirelessly on the pier 70 project for years. Several times it was called a labor of love. I really believe that we are part of that equation now, and that our years of keeping the Noonan Building alive is seen with equal respect. I believe that both the Port and FC see our importance and relevance in this project. We are now in a perfect position to start a positive dialogue, and to begin shaping the future artistic core of Noonan Building history. We have tons of time. So we can be thoughtful and insightful. What do we want to pass on to the next generation of artists? What can we share with them from our decades of experience? What advise can we give to the Port and FC in taking our "seed" and encouraging it to grow? Later this summer the Port and FC will schedule a meeting with us to go over the options that we will explore together over the next 10 or so years. We will keep you posted as to when that will happen. For now, FC will spend the next 3 years drafting their plan and getting approvals. Orton will work on the historic core buildings. Crane Cove Park will also evolve over the next few years. The Waterfront project with FC is scheduled to begin in 2016. It was really great to attend yesterday's meeting with Suzy, Marti, Henry, and Susan Eslick, and to see Pamela at the moment of departure. Thanks everyone for caring about our special place, the Noonan Building. On Wednesday, May 15, 2013 Marti McKee, Kim Austin, Connie Harris and Suzy Barnard attended the monthly CWAG meeting, which took place at the Port's offices at Pier 1. CWAG (Central Waterfront Advisory Group) consists of a committee of community advisors, and they've been paying close attention to all the Port's plans in our area for many years. They have a real understanding of the planning process and all the moving parts. The main topic on the agenda was to hear presentations from both the Port and Forest City developers on the Term Sheet. Marti spoke, she gave a short summary of the statements made by Kim and Adele the night before at the Port Commission meeting, and Kim also gave an eloquent testimony expressing the passion we feel for the building and Pier 70. We came away feeling encouraged, and like we'd been heard. CWAG expressed their awareness and support for our community, but strongly encouraged us to be involved in the process, and to show up to as many meetings as we can stand. They also said they felt confident that Forest City and the Port would do the right thing by us. The Port stated that the demolition of the Noonan Building would not happen for another 10-15 years (! ), and Jack Sylvan (Forest City) apologized to us for not including us sooner, and made clear overtures that he wants to reach out. Here's a link to CWAG's agenda for this meeting. The San Francisco Port Commission held a meeting yesterday, May 14, at which there was an informational presentation of the Term Sheet between the Port and Forest City Development California, Inc. for the mixed-use development of the Pier 70 Waterfront Site. Here's a link to the agenda for yesterday's meeting. Noonan Building Artists representatives Kim Austin and Adele Shaw made presentations for us before the commission relating to this issue. Also attending the meeting were NBA members Marti McKee, Connie Harris, Henry Jackson and Pam Axelson. The photo of Kim and Adele above was taken by Connie. If you'd like to read the statements presented to the Port Commission by Kim and Adele, you can download PDFs below.